Last week a WAMU listener wrote me to ask if she could post my latest commentary on her blog. It’s fun to find out that not only are people hearing my commentaries, some of them actually like what they hear! You can read my commentary and her blog here. My next Metro Connection commentary airs today. Looks like I am back in that prime – best for last – time slot again, around 1:50PM. A little preview here, the commentary is about “real” food, vs. what most of us eat. My favorite part of researching this, which didn’t make it into the commentary, was when I found a statement, (I think on the USDA website – but don’t quote me there), saying that if frozen pizza companies use the term “real cheese” on their packaging, they have to have at least 2% actual cheese in their cheese product to make that claim. I love it. You can say it’s real if it’s 2% actual product. And the cheese lobby had to fight for that! My commentary has been officially “archived.” It’s not a bad thing. 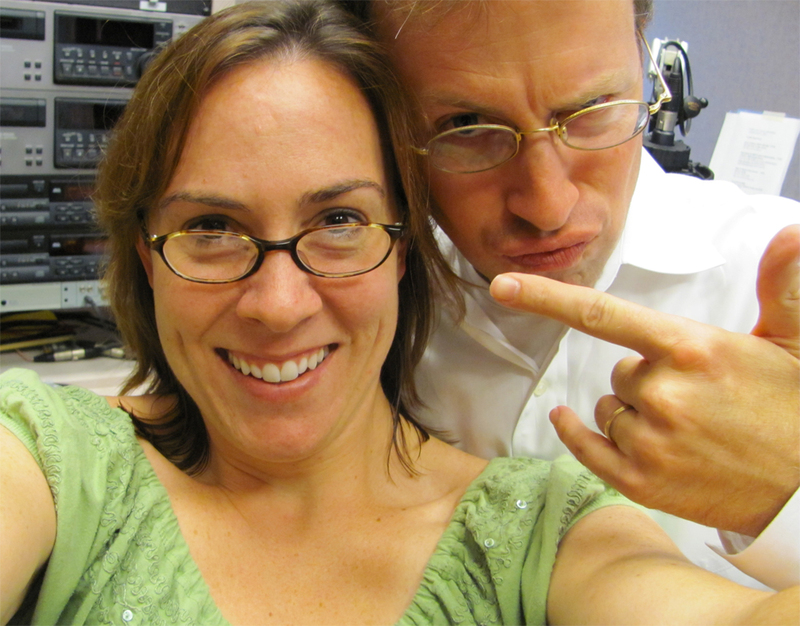 Every show on WAMU gets archived and that way it will live on long after I am gone – cause the internet is permanent! If you didn’t get to hear me live on 88.5FM in DC, click the link to listen to my commentary Life’s Little Traffic Jams. Is it July already? Man, how time flies when it’s in the nineties! I just recorded my latest commentary at the WAMU studio this past Monday. Here is a photo of me and David Furst. He’s trying to do the Colbert thing, but isn’t quite there yet. Not to mention, the station didn’t have the budget for someone to take our photo. My commentary – which I like to call “Damn This Traffic Jam” after one of James Taylor’s more poetic songs – will air this Friday, July 2nd, on Metro Connection. Metro Connection runs from 1PM – 2PM on WAMU 88.5FM and online at wamu.org. I was just part of a panel discussion last night and one of the women there really summed up my life. Jo Golden, of Chaos to Clarity, spoke about a fictional character named Jane. Jane was a French teacher, landscaper and fine artist. Jane wanted a website to grow her businesses but everyone kept telling her she needed to have three separate identities. In the end, Chaos to Clarity helped Jane define her story so that all the seemingly disparate elements of her life came together into the story of a highly educated, artistic landscaper and hands on artist. This week, I have definitely felt very disparate. I have been finishing up editing a wedding for my company Jessica Pi Productions, as well as discussing with a bride’s family being the videographer for a wedding NEXT MONTH. I had to prepare for, promote, and be part of a 2 hour panel discussion on Content Strategy for the Web, in which I, wearing my Capture Video, Inc. hat, explained video’s place in the world of online marketing and SEO. That was last night. Today I am preparing for and promoting my upcoming performance, Fan Freaking Tastic – THIS SATURDAY! at Chief Ike’s. I am performing a story, but it is for a comedy crowd, so I had to punch up the humor. I am also trying to bring all the promotional items and details together for the upcoming Nature House storytelling event in July – to raise money for the Nature House, as the chair of the marketing committee and a storyteller. And, on top of all of that, I have had to schedule in my next studio time at WAMU to record my next commentary which, as fate would have it, is all about trying to make time – and failing. I can’t say I don’t love most of what I do and all the different hats that I wear. I just sometimes wish I had learned to juggle. What do I have in common with Mike Rowe, host of Dirty Jobs? Listen to my commentary, “Getting Dirty,” to find out. My latest commentary aired last week on WAMU and was inspired by my experience renting out my townhouse. Believe or not, it has very little to do with the real estate market. Listen to the commentary here! I just recorded my next commentary at the WAMU studio. I really enjoy going down there, hanging out with David Furst, and recording the commentary. He often has little notes for me along the way, which I would begrudgingly say are usually helpful. I was inspired, as usual, when I got back from recording so I just submitted my story, “A Long Time,” to Cream City, an online magazine. At this rate, with multiple submissions a month, I am going to actually run out of short stories fairly quickly and may need to start writing some more. Oy vey!